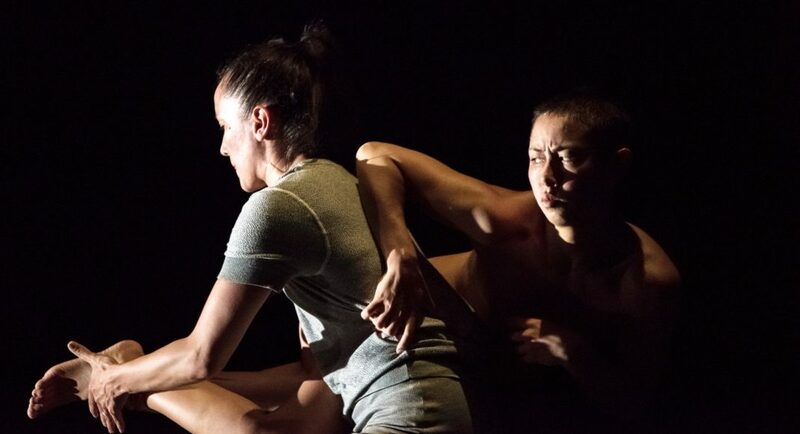 SPLIT began with two dancers, one wearing a rather drab, blue-grey dress, the other naked, performing on a marked-out square on the floor of the Studio, the Sydney Opera House’s most intimate performing space. Both dancers executed the same movements in unison. At times the choreography consisted of small movements of the arms, even just the fingers. At other times it gathered momentum and was almost wild as arms flew up and around. Sometimes it was done on the spot. Other times it moved around the marked-out square. The dancers were astonishing, both of them, in keeping together no matter what the choreography encompassed. They reminded me of the best Cunningham dancers whose sense of ‘body time’ produces similar qualities. But, in this opening section, what fascinated me more than anything else was how different the choreography looked on the naked dancer (Lilian Steiner) from the view one had of it on the clothed dancer (Melanie Lane). On the naked body the choreography showed how remarkable and articulate the dancing body can be. This is not at all to take away from the performance of Lane but it was a shock to see how much of the mechanics and beauty of Lucy Guerin’s choreography was lost with a covered up torso (as naive as that might sound). After this opening, and also longest section, the splits occurred. Over the course of the performance the dancers stopped several times and, using white tape that adhered to the floor, divided into two the space in which they had been dancing. After several such divisions, the space was so small that the show came to an inevitable end. And of course as the space got smaller the connections between the dancers was affected, as of course was their freedom to move. But, while the split caused by these divisions was spatially determined, there was also an emotional split between the dancers. The unison dancing gave way to what was a kind of anger-driven connection between them. There were times when silent screams seemed to fill the air and in one tortured moment it looked like Steiner was ripping out Lane’s insides and eating them. A few recurring motifs indicated ongoing conflict. But in my mind there was also a split in Guerin’s approach. At times she seemed to have made SPLIT from a totally intellectual point of view. The beautiful unison of the opening section was quite matter of fact in many respects and throughout that opening section there was no real emotional connection between the dancers and us—no change of facial expression for example. And the spatial division made in subsequent sections was also quite matter of fact. It was simple geometry. Even the timing was intellectually motivated with each section being half as long as the preceding one. So how then did we sit on the edge of our seats as the work progressed? That effect was not matter of fact but emotional involvement. Extraordinary really. Music was by London-based electronic musician Scanner and was just a two and a half-minute sample on a loop. (I read this in an interesting article about Guerin and her musical tastes in the August 2018 edition of Limelight). It was relentless, as one might expect, but its match with the choreography was absorbing. I also enjoyed being drawn in by the lighting (Paul Lim), which moved between down lights and side lights, with the latter projecting shadows of the dancers onto a white screen at one side of the performance area. SPLIT was a totally absorbing 45 minute (or so) show and was brilliantly danced by Lane and Steiner. I look forward to Lucy Guerin’s next show and regret it has been so long since I saw her work.